Stacy Tilton Reviews: Make Oriental Trading your one-stop-shop this holiday season! 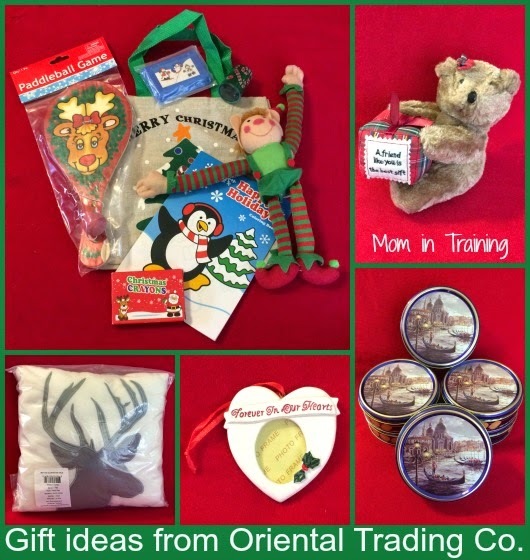 Make Oriental Trading your one-stop-shop this holiday season! When you hear the name Oriental Trading do you associate it with crafts and novelties? I know that was the first thing that used to come to my mind. I say "used to" because now I have a totally different perspective and view of them. They are truly so much more and I'm going to share some of that "more" with you now. Besides having lots of great ideas for holiday crafts, and yes the little novelties you can pass out to kids for various activities. They also have some really great, and unique gifts. ChristmasDesign Filled Treat Bag A very nice assortment of stocking stuffer type goodies that fit in a cute little canvas bag. Great for small classroom gifts, or for your child's friends. “AFriend Like You Is the Best Gift” Bear I got this to give to my best friend for Christmas. He's super cute and just the right size to pair with a gift card. A great gift that you won't find in stores! StagSilhouette Pillow Another gift you won't find in stores. Know someone that likes nature, or maybe hunting? This is the perfect gift for them and will be a great addition to their couch or chair. “Foreverin Our Hearts” Picture Frame Christmas Ornament This is a great way to always remember a loved one you've lost around the holidays. I plan to put a photo of my aunt that passed away this year inside and give it to my grandma for her tree. ButterCookie Tins A deliciously smooth buttery tasting cookie. (I ate almost a whole tin all by myself they were so good!) These would make a great neighbor or teacher gift. Of course Oriental Trading is still a great place to get crafts and themed candy for the holidays, don't let me steer you away from that. Besides the basics you can also get other great candy supplies too. Candy Canes with A Religious Card Looking for something fun to hand out to your Sunday school class? These are a great send home for the kids so they can take the lesson home with them. Milk Chocolate Flavored Fondue Dipping Candy If you're like me you will agree pretty much everything is better with chocolate! With this bag of chocolate flavored fondue you can dip until your heart is content - or you run out of things to dip! Beaded Snowman Bracelet Craft Kit Need a craft but don't want it to be something that gets tossed in the trash once it gets home? These snowman bracelets are super cute and very easy to string. I put this one together in a matter of minutes. 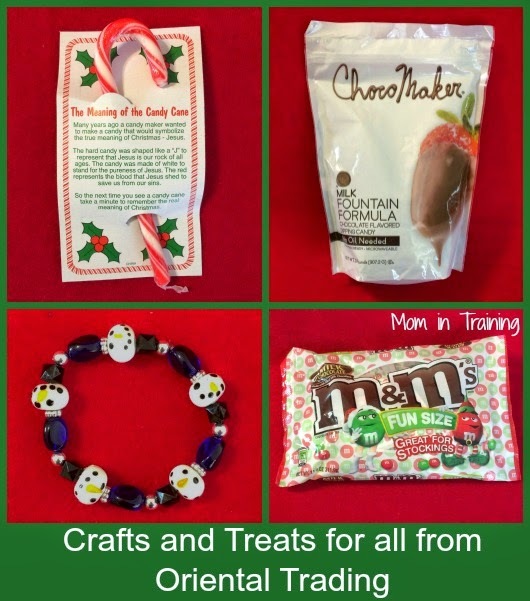 M&M’s®Holiday Exchange Packs These are great for tossing into lunches, for kids to pass out at school for classroom parties, or to just have around the house when you need a little chocolate fix. So next time you hear the words Oriental Trading I hope you remember they are more than just a great place to get crafts and novelties. They can be your one-stop-shop for the holidays too! They have some cool stuff. I love shopping at this place. They really do have a lot of stuff there. I love Oriental Trading - when I taught Sunday School, they were my go-to for prizes, etc. Great quality and savings! I love when I get these catalogs! They have everything!